Well, actually the last attempt was pretty lame. I knew going in I didn't have a realistic chance but this time I am hoping things will be different. Karla and I had made the decision it was time to get serious about getting back to Boston last year since she was finally getting back to normal and I was getting over the injuries. We began training on a regular basis and after I finished my Ironman last June it was time to focus on running. Since June I have increased my weekly mileage considerably and tried to stay consistent. We began going to the track again in the Spring but really got focused on that in the summer. Looking back over the training log I was actually surprised how well we had done, only missing three workouts since last August and all three of those were the weeks after racing a marathon and two 50 K's. We have been meeting on Tuesdays doing a mix of interval workouts from 330's, 1k's and 2k's in the summer to mostly 800 and mile repeats over the Winter. I have seen steady improvement and it's been really fun to watch Karla reach a new level with her running. 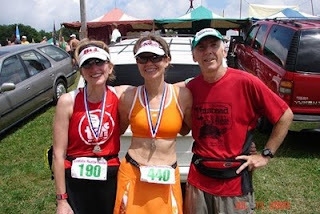 We picked up a new running partner early last year too, Lisa "Mountain Girl" Howell who is in the picture of the three of us at Grandfather Mountain last July. She joins us on our Saturday long runs and we occasionally get together for about 10 miles on Thursdays. If I don't run on Thursday with the ladies I usually do a tempo run. I've also been doing a marathon pace workout on Mondays. I feel good about my chances for qualifying this Sunday morning, especially since I now can run 10 minutes slower ! I need a 3:45 now. The plan is to go out conservatively and get the qualifier and worry about running faster and shooting for a marathon pr later. The ladies are both running exceptionally well too and I expect them both to qualify easily. They both need 4:05 and they will also be running just for the time. If she is successful it will be a pr for Lisa. Karla could probably run a pr too but like me she will save that for another day. Best wishes for the marathon! I will be there with my camera to capture the event. Looks like the weather is on your side too. Good luck Joey! Hope all that hard work pays off in spades! They say"it ain't braggin if you can back it up"YOU DID IT.Beantown,get ready!! !